Mike's LASIK Hell was created to help expose the dishonest, corrupt, and dangerous LASIK industry that many patients have fallen victim to. Without websites like this and many others, potential patients would only see the false information advertised by the doctors and industry who profit from LASIK. I have documented my own experience of having my vision permanently damaged by two LASIK procedures performed in 2010 at First Eye Care in Dallas, TX. Potential patients should be aware of the dishonest, unethical, and illegal tactics used by my doctors to dupe me into a procedure that I would not have consented to if properly informed and not lied to. Tom Ballard, OD and Larry R. Taub, MD are responsible for lying to me and permanently damaging my vision. View their lies here. 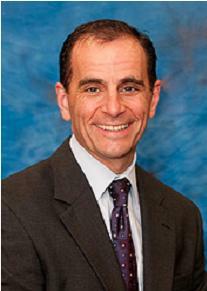 Tom Ballard, OD and Larry R. Taub, MD stole the quality of life I once enjoyed. You can read some of the complaints I have filed with the Texas Optometry Board and Texas Medical Board Here. First Eye Care Dallas screens patient submitted reviews prior to displaying them on their website. They falsely advertise their patient satisfaction as being higher than it really is. During a phone call with a DemandForce representative she confirmed that my review was submitted on 4/22/2012 and requested to be removed by First Eye Care! You can read more about this in the My Doctor's Lies section. Because they refuse to make my review public, even though it met all requirements at the time it was posted, and because the Texas Optometry Board refuses to protect the public from these doctors, I will warn the public myself. Tom Ballard serves on the board of directors for First Eye Care, Inc. and has not been removed even though many First Eye Care doctors at many facilities were warned of his illegal, unethical, and dishonest tactics in this letter that I had sent to nearly 50 doctors of First Eye Care. I warn you to be extremely cautious if visiting any facility that is part of First Eye Care, Inc. or Infinity Laser Vision Associates! Always get everything in writing and video tape all visits if possible. An honest doctor should have no problem with this. I will continue to sacrifice my dignity and stand in front of First Eye Care facilities with the sign below, warning the public until justice is served. They have attempted to violate my civil rights and silence my efforts by calling the Dallas PD in an attempt to have me removed from the sidewalk in front of First Eye Care Dallas on LBJ Freeway. Two of the most respectable and courteous officers I have ever met arrived and we spoke briefly about why I was there. I was informed that I was exercising my rights and could carry on. I thanked them and continued for another 5 hours. Do not be afraid to stand up for yourself and for others who have been injured! Take your fight to the front lines outside of your doctor's office. Inform others how LASIK has ruined your vision. Check back in the near future for updates to the website. Your feedback is greatly appreciated Contact Me. Please protect yourself and your vision and do not become one of the thousands of LASIK victims. Take the money that you would spend on refractive surgery and use it to see the world and experience life. Buy a nice pair of glasses or take advantage of one of the many contact lens options available such as Air Optix that you can sleep in for up to 30 days, perfect for a camping trip. Use the left over money to take a vacation in the Bahamas, see the glaciers in Alaska or the Pyramids in Egypt. The world is a large and wonderful place when you can see well. 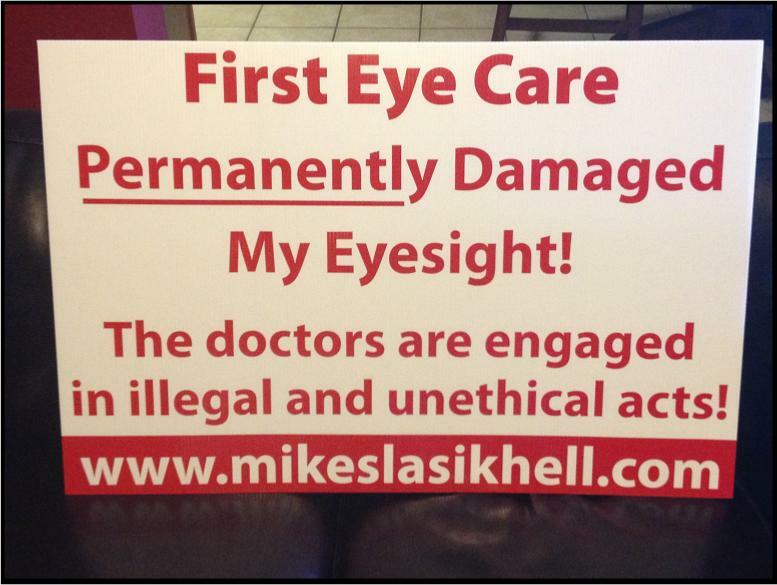 Look for me outside a First Eye Care facility near you! If you have been injured and plan to picket the office of doctor(s) responible for damaging your vision, and are in Dallas or surrounding areas please contact me. I will be glad to stand outside with you and support your efforts. Your vision has been permanently damaged by a medically unnecessary procedure, do not be afraid to let everyone know who did it. Much like a patient weighs risks associated with surgeries, doctors must also weigh risks if they are willing to perform medically unnecessary procedures on healthy patients. Add some weight to that risk by picketing outside your doctor's office if you have been injured. Make doctors assess if it is worth risking their business to perform medically unnecessary procedures like LASIK.